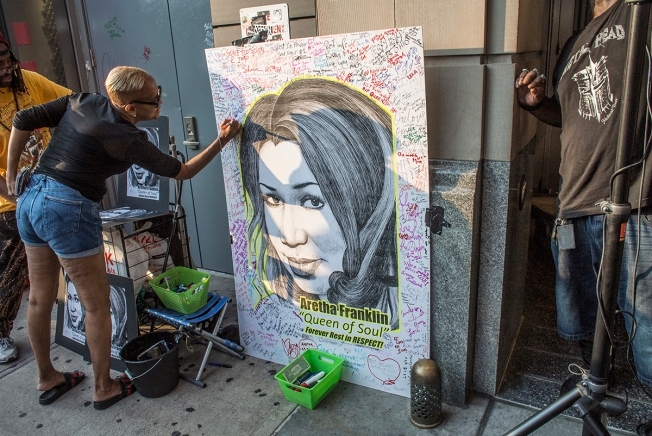 Fans attend a sidewalk memorial gathering for Aretha Franklin in front of the Apollo Theater August 16, 2018, in New York City. Fans danced to Franklin's songs being broadcast over speakers, laid flowers, took photos near her name engraved in the sidewalk and signed a poster-board with Franklin's likeliness on it in tribute to her. Though she lived to 76 and was terminally ill with pancreatic cancer, the Queen of Soul died without a will. Estate law experts expressed surprise but not shock that a wealthy person like Franklin would put off making a will until it was too late. At least one of the singer's attorneys says he urged her repeatedly over the years to draft one. Celebrities on the 2018 MTV VMA red carpet paid tribute to the late Aretha Franklin just moments before the show started. "I tried to convince her that she should do not just a will but a trust while she was still alive," says Don Wilson, a Los Angeles lawyer who worked on entertainment matters for Franklin for nearly 30 years. "She never told me, 'No, I don't want to do one.' She understood the need. It just didn't seem to be something she got around to." Laura Zwicker, an attorney who specializes in estate planning but is not affiliated with the Franklin estate, says she sees it happen all too often in her work. "People don't like to face their own mortality," Zwicker says. "I had a client who had a $70 million real estate portfolio who had had end-stage diabetes. He had plenty of conversations with me about estate planning but would not sign the documents." She was not married and left four sons, ages 48 to 63: Clarence Franklin, Edward Franklin, Kecalf Franklin and Ted White Jr. Clarence, Aretha's eldest, is incapacitated and is represented by a guardian. And a niece of hers has accepted the role of executor. Under Michigan law, as in most states, the sons will equally divide their mother's assets in the absence of a will, and so far no signs of conflict have emerged among family members. Bennett did not respond to phone and email messages seeking comment. Aretha Franklin's friend Ron Moten, a Michigan businessman, gave the four sons some guidance in his speech at Friday's funeral. "Remember your family, and friends that have been with you for years," Moten told the men. "Because you are about to meet a lot of people who will now want to be your new best friend. You will also meet some people that will have the best investments in the world for you. My advice? Go slow, be careful and be smart." The documents make no mention of the value of Franklin's estate. The figure almost certainly runs into the tens of millions, but there will probably be widely varying estimates as her attorneys seek to downplay her wealth for tax purposes and the IRS tries to maximize the amount for its own reasons. Franklin maintained ownership of the songs she wrote and did well by them, Wilson says, though of her major hits, "Think" is the only one that's her own composition. She also wrote some lesser hits, such as "Rock Steady." Though her records were played millions of times, she earned little in radio royalties from smashes like 1967's "Respect" because such payments go overwhelmingly to the song's author, not the performer. In the case of "Respect," the royalties go to the estate of Otis Redding, even though the song owes nearly all its popularity to Franklin. "I would imagine she probably felt she was entitled to more, but probably received more than a lot of artists from the time, especially African-American artists," Wilson says. Among Franklin's more tangible assets are several pieces of property in the Detroit area that according to tax assessors' estimates are worth at least $2 million, with a market value that could easily be twice that. Once the value is established — a process that could take years — the IRS will take any back taxes Franklin owed, then will tax her estate at 40 percent for any assets beyond $11.2 million. Kenneth Abdo, an attorney who specializes in probate law and has worked on the estate of Prince, who also died without a will, says the IRS will conduct an audit of her holdings. Wilson, her entertainment attorney, says she would not have wanted to see her finances publicly aired: "She was a private person." As for why some clients don't make out a will, Zwicker said some heirs, like Franklin's son Clarence, may need more than others, and that can be a difficult and touchy decision for a parent. "One arrangement may be fitting for one child, where other people need more help," Zwicker said. "To accept that and put it on paper can be hard for a parent."